A program for Windows Mobile Smartphone devices. 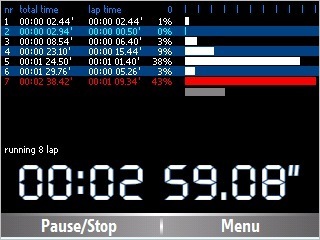 to count several lap times. and take/review several lap times. to increase exercises and control or fix result of records. Before you will reset all times or close this program, you will be asked if you want to save all times in ordinary text file for future reading/using. This VErsion is for Windows Mobile Smartphone with landscape screen. Trial Version works 7 days without limits. In the meantime you have to decide to buy this program. use it and then it will overwrite all necessary files. Copy the downloaded file to your Smartphone and run to start the installation. 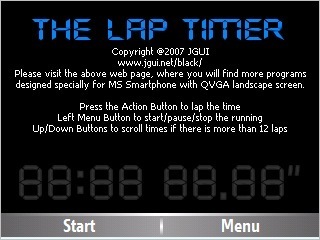 JGUI logo, name, picture are registered and copyrighted by JGUI. Pocket PC, Windows Mobile, MSN Messenger names and marks are registered and copyrighted by Microsoft.